Experience the famous sizzle of Ruth’s Chris Steak House. Maybe you’re a local or maybe you want to feel like a local. Either way, we’ll make sure you experience the sizzle factor here at Ruth’s Chris in Salt Lake. Whether you’re joining us for a quiet intimate dinner or hosting a business meeting, our staff works to ensure you have an experience that exceeds your expectations. Our contemporary-designed restaurant sets a tone of sophisticated excellence without the stuffy or formal vibe you might associate with fine dining. Yes, we serve fine food with impeccable service, but you don’t have to wear a tie or set of pearls to experience it. 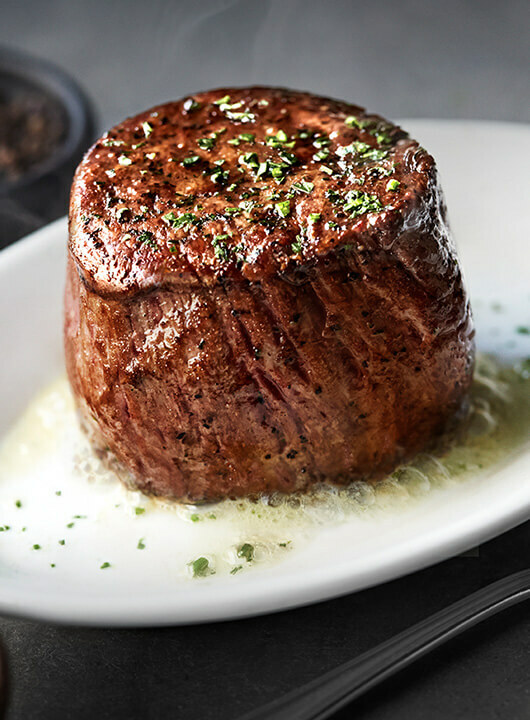 Start your evening the Ruth’s Chris way—over a mouth-watering filet. Sit back and enjoy the most tender hand-cut steak you’ve ever tasted, served sizzling on a 500° plate. Our extensive a la carte menu features fresh seafood, a variety of vegetable dishes, and six potato selections. Enjoy our warm, elegant atmosphere and Ruth’s Chris genuine hospitality. Ruth's Chris Steak House Salt Lake is independently owned and locally operated. We look forward to serving you soon. Take a tour of Ruth's Chris Salt Lake City before you dine. From first impression to last bite, your event here at Ruth’s Chris Steak House in Salt Lake City will be managed with detail-driven perfection. Combining unique new beauty and comfort in five elegant private dining rooms, your guests will experience a unique dining experience that exceeds their expectations. You may be planning an intimate gathering for eight to 12 guests within the Crescent Room, or a spectacular event for 40 to 100 within the New Orleans Ballroom, our spacious private dining rooms provide the perfect setting to impress your most important clients, employees and guests. Enjoy valet parking drop-off, just steps away from the front doors under our porte-cochere at the West Temple Street entrance. Street parking and Self-Park lots are also abundant next to restaurant. Walking distance from public transit. Take UTA Trax to the Gallivan Center stop on Main Street, walk half a block south and turn right onto 300 S. Ruth’s Chris Steak House is one block down on the right. Located in the heart of the dining and entertainment district of Downtown Salt Lake City, adjacent to the Hilton Hotel and one block south of the Salt Palace Convention Center. Within walking distance of City Creek Center, Temple Square, Vivint Smart Home Arena (home of the NBA’s Utah Jazz), Downtown Salt Lake City’s theater district, including Ballet West, Capitol Theater, Abravanel Hall and Eccles Theater, and many hotels, including The Grand America, The Little America, Hotel Monaco, Marriott City Creek and Marriott City Center. A short drive to Utah’s Hogle Zoo, Red Butte Gardens, the Natural History Museum of Utah, Kingsbury Hall and the University of Utah’s Rice-Eccles Stadium. Only a 15-minute drive to Salt Lake City International Airport. Get the best steak house experience at Ruth’s Chris Steak House in Boise, Idaho. Our special 500° sizzling plates and award-winning wine list are the perfect pairing for any occasion. Whether you’re joining us for a romantic dinner, a business meeting, a private party or just a drink at the bar, our Boise steak house will deliver superior service and an unforgettable dining experience.